This week, our Food Detective meets the people behind Burger Bakar Kaw Kaw, the stall that’s whipping up a frenzy for street burgers. 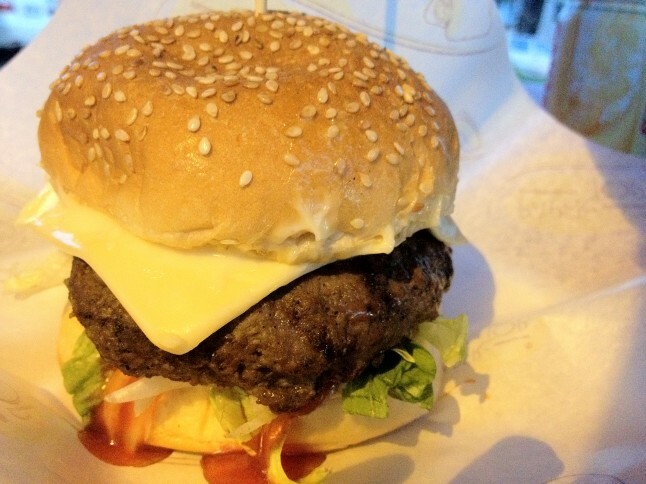 Midnight burger binges along the street will never go out of trend in KL. We’ve all been there, waiting in line at ungodly hours of the night to stem that greasy craving. 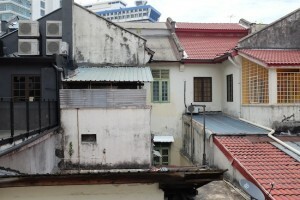 Noticing this hunger among KL-ites, two opportunistic individuals founded Burger Bakar Kaw Kaw in Wangsa Maju last year. The rest is delicious, perfectly grilled history: since Burger Bakar Kaw Kaw was founded, it has built a legendary reputation for its queues and celebrity fans: among them, Khairy Jamaluddin, Razif Hashim and Remy Ishak. Before I begin, a warning you must heed. The burgers here are not for wimps. You know the beefy, high school football jock who can carry a bench, set it down and spit on the ground while everyone around him wolf whistles their admiration? That’s Burger Bakar Kaw Kaw. Here, even just a single beef burger is a towering sight to behold. But dear reader, take note: for the adventurous or crazy, the burgers here can go up to ten tiers. On my first trip here, I commited two rookie mistakes – I wore a white top and I had eaten a huge lunch. The towering burger arrives, stacked with cheese and beef bacon, and what a sight it is. Tongues of bacon hang lazily around a chunky hunk of meat and the sliced cheddar casually droops outside the parameters of the bun. Yet, despite its promiscuous appearance, the ingredients are all well balanced. The patty is well-spiced and charred to perfection. It lacks the artificial juiciness I’m familiar with at a street burger stall, but I put this down to the hand-ground technique of preparing the meat. The mayonnaise is also hand mixed, and a recipe for homemade ketchup is also currently in the works, which should add the finishing artisanal touch. 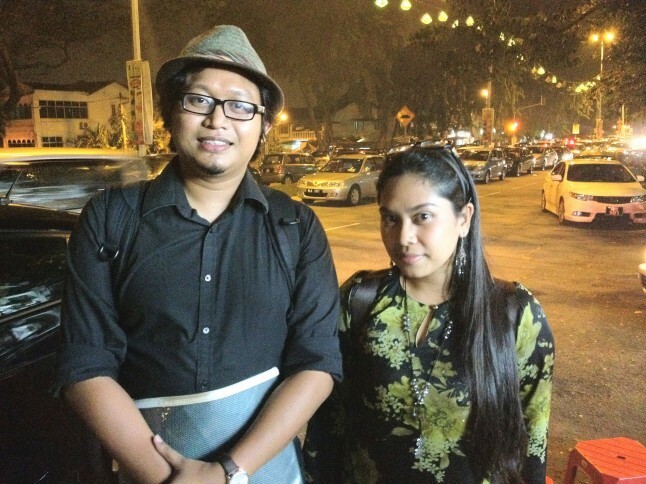 Nita and Zul, founders of the wildly successful stall, have plenty to be grateful for. In less than a year, business has since shot through the roof, resulting in long queues, three-hour waits and two other branches. From initially rolling out 100 patties a day, the staff now produce up to 2500 patties a day at an average of 350 an hour. This explosion into the burger scene is not simply a matter of fate, as Zul explains. “Kan orang suka makan benda yang bakar-bakar macam ayam bakar, ikan bakar so kita buat burger bakar.” This realisation forced them both out of the telecommunications industry (a call centre to be exact) and into the mad business of food. The issue of long waits have become a somewhat dire issue for Kaw Kaw fans and to solve this, Nita and Zul have given in to machinery. “The only machine we use now is the mixer but not the moulder”, they tell me. This means that patties are not identically shaped, as each is made by hand. The wait has now been reduced to a maximum of 25 minutes during peak hours. 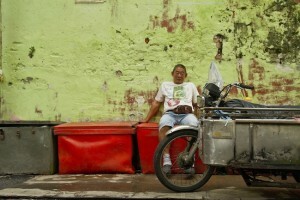 However, space is still a lingering issue, so customers often make do with takeaway. This brings me to the duo’s future plans of penetrating the fast food industry. A pilot outlet featuring these rebranded products will soon be open at Ampang while they wait to qualify for application of franchising to the Malaysian Franchise Association. As Nita and Zul scurry from meeting to meeting to supervise the maintenance and growth of the brand, copycats stalls have unsuspectingly popped up in Wangsa Maju claiming to be the first stalls to invent the burger bakar. However, Nita and Zul are blasé about this matter as they have more important things to deal with, including social media monitoring, safeguarding of SOPs and keeping to KPIs. Well, Nita and Zul best get used to such obstacles. With great burgers, comes great responsibility.